I had a big pack of cornmeal and when I was searching for recipes using it came across Johnny cakes aka hoecake, journey cake, shawnee cakes. 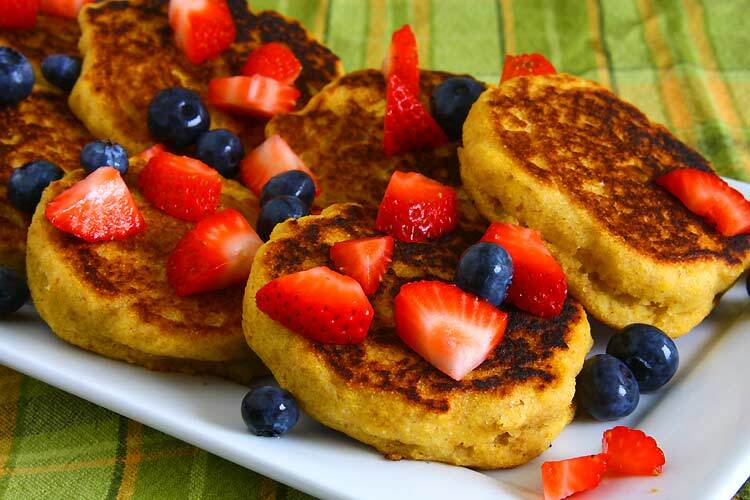 These johnny cakes originate from the native inhabitants of North America. 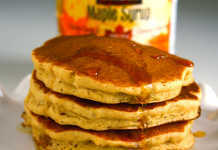 The original johnnycakes were made from yellow or white cornmeal mixed with salt and hot water or milk and sometimes sweetened. The word hoecake is also used in Southern US states, although this can refer to cornbread fried in a pan. 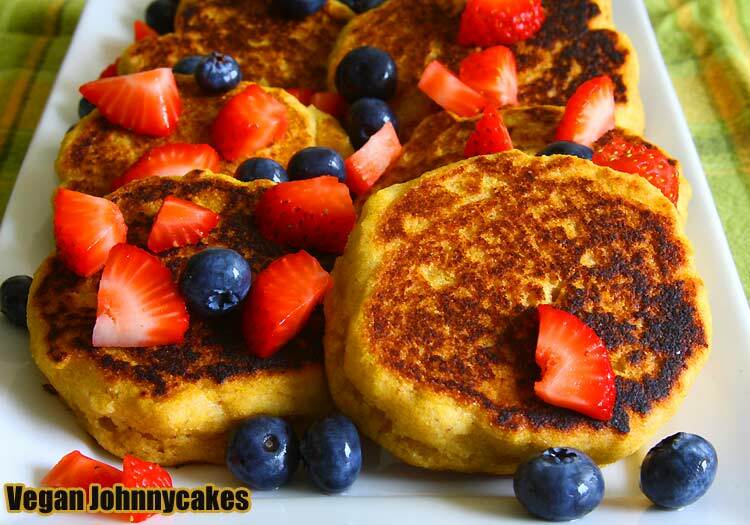 Modern-day johnnycakes are more like pancakes more specifically cornmeal pancakes which don’t require preparing a porridge-like meal and frying it in a thick cast iron pan. 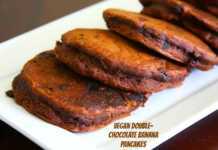 The below is my version of a vegan johnny cake recipe based on this recipe. The original recipe, of course, used all-purpose flour and eggs which I have replaced with whole wheat pastry flour and also made it completely vegan. I use cornmeal in my waffles recipes to give it a nice crunchy texture but this is the first time I have used it in a pancake recipe and although the pancakes didn’t turn out crunchy it had a very good taste and texture. 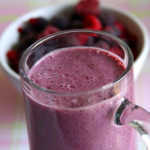 Getting bored of the usual pancakes? 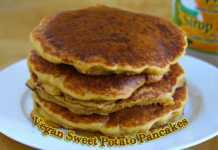 Try these vegan cornmeal pancakes or johnny cakes for a change and it will become a regular at your house. 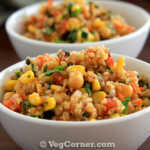 The taste and texture will make you feel like you are having a cornbread. Pour the wet mix into the flour mix and combine together until the flour is all moistened and mixed well. Few lumps are ok. Do not over-mix. Set aside the cornmeal pancake batter for at least 5-10 minutes. Add some more milk/water if you think the consistency of the batter is too thick. Heat a non-stick pan/griddle. Once it is warm enough add about 1/3rd of a cup of the pancake batter to the pan. I used an ice cream scoop to make these johnnycakes so that it will be all be in the same size. 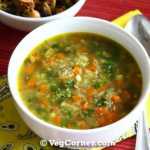 You will see air bubbles forming indicating that it is getting cooked. Flip it over and cook it for another minute or so. 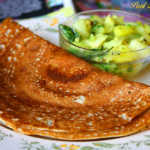 Repeat it for the rest of the batter and serve it warm with maple syrup, coconut whipped cream or cut up fruits/nuts. This johnnycake feels like you are having an instead cornbread. The texture is different than your usual pancakes but the kids enjoyed it. Whole wheat pastry flour, cornmeal all absorbs a lot of liquid, so you might have to increase the quantity of water/milk if the pancake batter has a thicker consistency.